What wondrous timing! Just as a new, mech-free game mode is announced for Titanfall, we get a statue that's 75 percent pilot, 25 percent debris and zero percent giant killer robot. While having a giant robot to boss around is all well and good, the more I played Titanfall the more I, like many others, fell in love with the freerunning fleshy bits of the game. We've all piloted mechs, but jumping over a mech being piloted by someone else? That's the stuff right there. Gaming Heads' 23 inch tall Pilot statue captures that feeling quite nicely. Looking at it I realize that this is exactly what I'd rather be doing than sitting at my desk writing about a statue depicting exactly what I'd rather be doing. It's not the shooting. It's not really even the jumpinging. It's that moment when you land the jump and do your little dance along the precariously-sloped catwalk. Man, what a depiction of a feeling. I imagine if I had one of these on my desk, I'd never have to play Titanfall again. 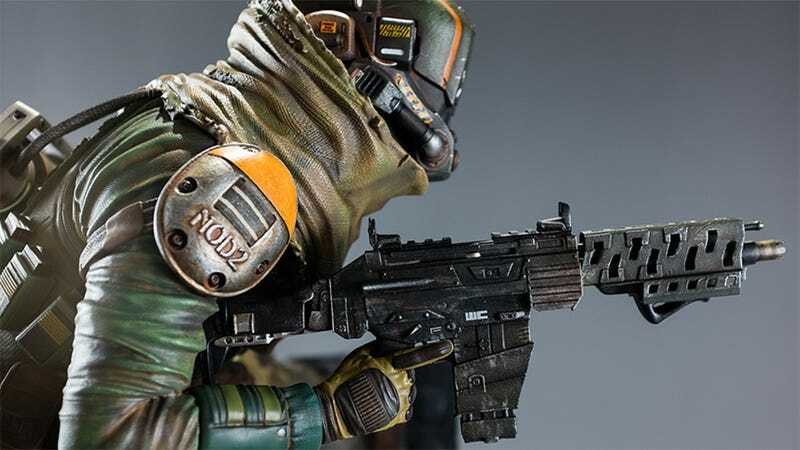 I'd just look over at it, smile with warm rememberance, and go about my day, no longer worried about having spent *checks preorder page for the regular edition* $329.99 on a Titanfall statue without a titan in it. Now that I've distracted my wallet with pictures of exquisite detail, note that the 2,000 piece regular edition is $20 cheaper than the 500 piece exclusive edition, which comes with the option of the R-101 Compact Carbine assault rifle, for the incredibly picky expensive statue collectors out there. Don't look at the Gaming Heads Pilot statue, arriving in the first quarter of next year, as a man without a robot. Instead, think of it as a lovely representation of the best part of a game centered around men with robots. That's positive thinking.